Edward Garnet Man was born on 8 February 1837 at Halstead Hall, Halstead, Kent, the son of Harry Stoe and Louisa Caroline (Fowle) Man. 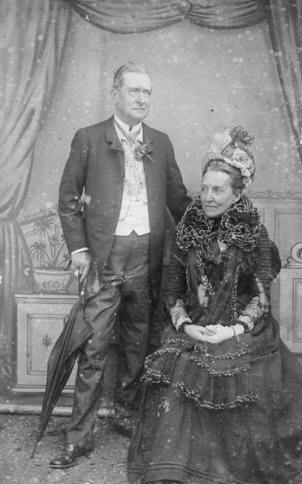 He married Catherine (Kate) Jane Matthews on 26 December 1867 at Calcutta Cathedral, Calcutta, India. He died, aged 83, on 14 November 1920 at ‘Ellesmere’, Nightingale Road, Godalming in Surrey and was cremated at St. John’s Cemetery, Woking in Surrey and his ashes were then interred at St. Margaret’s, Halstead in Kent. Kate Matthews was born on 9 March 1843 at 9 Upper Stamford Street, Waterloo, Surrey, the daughter of James and Mary Ann (Bailey) Matthews. 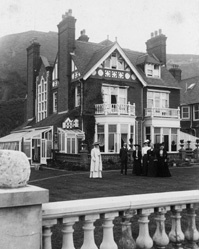 She died, aged 76, on 6 January 1919 at ‘Halstead’, The Riviera, Sandgate, Folkestone, Kent. 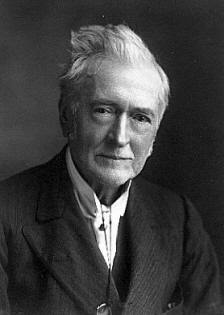 NOTES: Edward was a barrister, Justice of the Peace, Assistant Commissioner of Bengal and Government Advocate of Burma. He served with the 3rd Sikh Cavalry during the Indian Mutiny, He reported, among other things, on the Perak Wars for the London Times and was a Correspondent and Lay reader in the Canterbury Diocese. Both Edward and wife Kate were active in the Primrose League. His account of the mutiny, his lecture on immortality, his book ‘Sonthalia and the Sonthals’, ‘Papal Aims and Papal Claims’, letters to The Times, etc. can all be found at the end of this page under ‘Bibliography’. Edward’s death certificate is available HERE (<— PDF). His will has been transcribed and can be viewed on the wills page here. EGM’s family has been found on the 1881, 1891 and 1901 censuses (<— PDFs), although Edward himself is absent on the 1881 and 1901. He is listed on the Magistrates list of England of Wales 1900 – 1905 (<— PDF, 2 pages) prepared by Herbert Samuel. 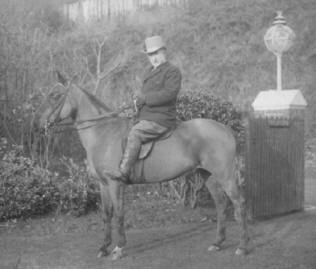 Tradition has it that after he had retired to ‘Halstead’, a house overlooking the channel at Sandgate, EGM would ride up and down the beach on horseback handing out his card to anyone he happened to meet and inviting them to lunch. His long suffering wife (Kate) never knew who to expect for lunch and it must have been quite nerve wracking for her when the door bell began to ring around noon. Some of the guests were of sometimes difficult remove once the lunch was over … Kate was a religious woman and prayers were held everyday before breakfast. On the back of the rather battered picture above is written ‘Mr. 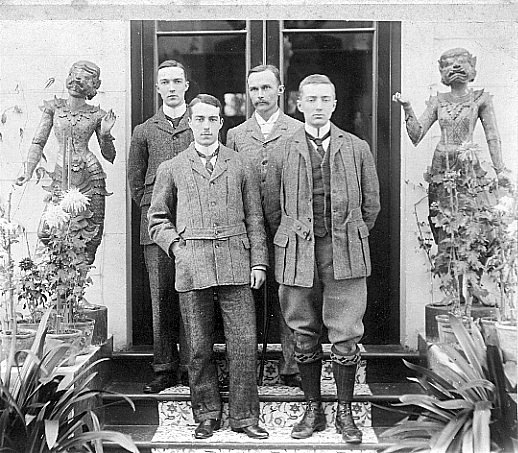 and Mrs. E. Garnet Man taken at the Bazaar opened by Mrs. Garnet Man’ and a later hand has written ‘probably taken at Rangoon’: Below, the four Man brothers from left to right: Harry, Morrice, Edward and Hubert. Below, the Man family in Dieppe: EGM is in the center with his right arm around Harry, Edward James Fowle Garnet stands over EGM’s left shoulder, Morrice stands in front of EJFG to his father’s left and next to his mother, Catherine Rosa stands between her father’s knees. Mary is next to her mother’s left knee. The governess stands behind EGM slightly to his right. The two young women standing are Josselyn and Beatrice. 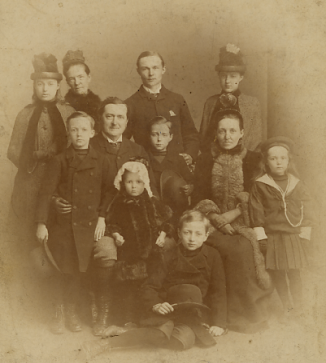 Below The Man family in the Channel islands: Tentative identification: Back row: Josselyn holding Elaine, Cecil Lowis, Catherine Rosa, Harry, Beatrice and Morrice. 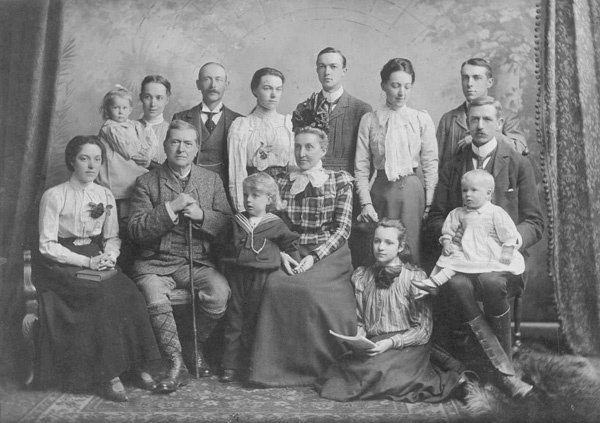 Front row: May (to be Casson), E.G.M., Graham Edward Adam, Kate (wife of EGM), Dorothy (seated on ground), James Graham Adam holding John Lindsay Adam. [In other words E.G.M and his first three grandchildren. Taken on the Channel Islands (Guernsey?) circa 1900]. Note that Kate and Morrice have been found on the 1901 census residing on the Channel Islands. 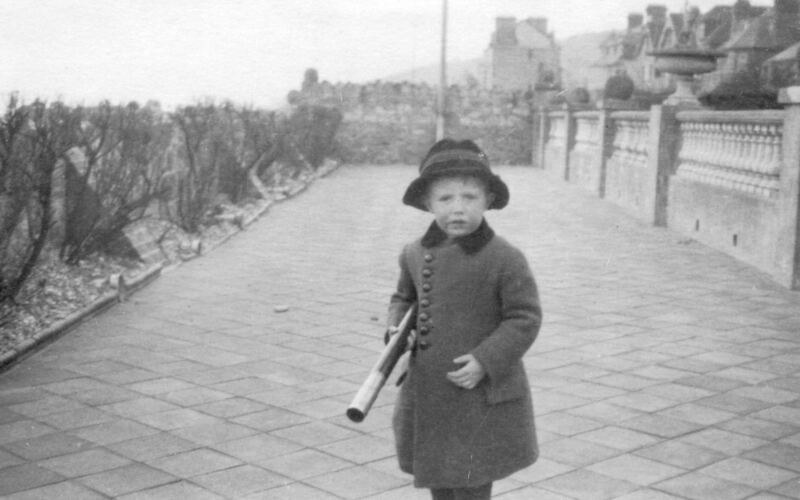 Above, the Man family at ‘Halstead’ Sandgate in the early 1900’s. Below Frank Man on the terrace at Halstead, Sandgate. 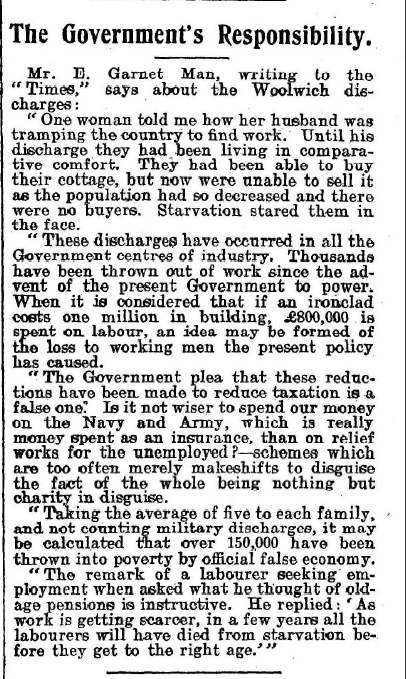 From the Folkestone Daily News, Friday November 15th 1912. The most eloquent and brilliant speaker at the Mayors banquet on Saturday night was Mr Garnett Man, an elderly gentleman of the old fashioned school, with that classical countenance, betokening the old British statesman and aristocrat that eloquence which takes us back to the olden times of Disraeli and others. He was one of the figures at the dinner, and at the reception, the honoured guest at the right of the Mayor, and his supporter at church on Sunday morning. Mr Garnett Man has resided with us for many years, and is fast becoming an old inhabitant. He is a wonderful man aged 84, with a notable and brilliant career at his back. Like those of his fast disappearing class, although having attained those years, he is as young and energetic as ever, full of work, advocating the political cause of his party by pen and voice, writing the most logical letters from his party point of view, or presiding at their meetings. As Chairman of the County Bench he is a model, which we have pointed out and do so again, that all young and newly fledged Justices of the Peace might follow. Uninfluenced by any suggestions or Clerk’s advice that may be brought the bear, he sits there with the calm dignity of a Judge, giving the same care and attention to the most trivial cases as to the most important. Of course he is an eminent lawyer, and has occupied the post of Attorney – General for India for many years at a salary of 8,000.00 per annum. He drafted the Municipal Acts, which give many towns in India their Charter of Incorporation, or self-government, the same as our own. He is therefore thoroughly conversant with all those laws bearing upon the subject. Previous to receiving that appointment he enjoyed one of the most lucrative and important practices as an English barrister practicing in India. One Illustration of character out of many. In 1854, as a young barrister, with all his honours, he went to India. The passage was taken in one of Green’s ships, magnificent at that time, but mere boats today. In crossing the Bay of Biscay they met with terrible weather and lost 14 hands. The captain called for volunteers from the passengers to assist in working the ship. 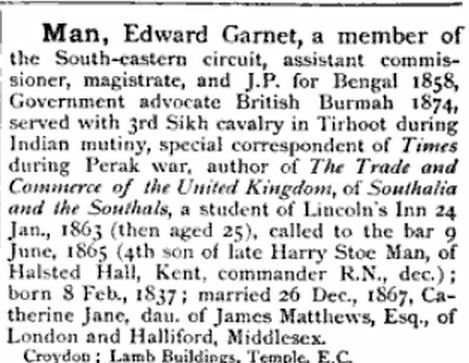 Mr Garnett Man, the young barrister, although inexperienced in nautical work, was one of the first to volunteer, and such was his aptitude and skill for learning and acquiring knowledge that within a week he was able to work the ship, go aloft and furl the top sail with any of the sailors. When settling down at bar practice in India he found the knowledge so attained most useful and profitable. His knowledge of nautical matters in Admiralty cases before the courts was such that he was the retained and favourite counsel of nearly every shipping company trading between home and India. His motto even today is, ‘Work and acquire all the knowledge you can.’ Such men as Mr Garnett Man have been the fibre of our Empire and we, with all our new fangled ideas and modern rush, finding others to take their place? To those who meet him he is genial, unostentatious, without pride or side, brilliant and witty to a degree. We trust he may long be with us. In January 1919 Catherine Jane Man (nee Matthews), wife of Edward Garnet Man (EGM) passed away. The letter below written by EGM addressed to the Bishop of Croydon relates a strange incident in which EGM claims to have seen a ghost. However what is probably of more interest is the fact that the letter reveals that EGM shared offices with Judah P. Benjamin who was the Confederate states’ Attorney General during the Civil War. Below is the letter. The pictures are of J. P. B.
I must apologise for not thanking you for your kind words of sympathy conveyed in your letter of Jan 9th before but I have been overwhelmed with correspondence and as one of it is so “out of the way” I thought it would be as well to submit it to you for your ripe judgement and status. My children have calculated that I have travelled 19 times up and down the Red Sea. Twice round the Cape – had to work my passage as a common sailor as we lost 14 sailors over board, served in the 3rd Sikh Irr Cavalry during the Mutiny and finally finished up as Attorney General in Burmah making a steady 8,000 pounds a year – during that long period of years – over 52 – I have made many queer friends and to my surprise after the notice of my wife’s death appeared, I have been inundated with condolences of many of whom I had long since forgotten. One of the strangest is from a Mr. King. He has recalled to my mind an occurrence which had long since passed out of my memory. During the war between north and south States of America – when the Southerners were defeated Benjamin their Attorney General came over to practice at the English Bar and I let him a portion of my chambers in the temple. Cockburn and many others took him up and he was making large business when he came into my room one day and said he had contracted heart disease and was a dead man – and he was going to Paris for a change but he made me swear that as long as I kept my chamber I would never take his name off the door. I swore — the Bar gave him a public dinner and as he left he recalled my oath. He went to Paris. Some month or so after I had been in a case against Murphy K.C. Norton and had won and we were walking across the Temple to my chambers (no. 3) when I saw Benjamin standing in my Porch and we all lifted our heads, we had our wigs on, to salute him – He stared us in the face, made no reply and passed down the lane – I remarked how strange and on knocking at my door, my clerk opened it and put a telegram into my hand – It was – Benjamin died this morning in Paris and we had just seen him!! It got in to the Times and caused a slight sensation at the time and I gave a dinner to celebrate the event. Many years had passed and now old memories are revived by the enclosed letter of a barrister whose very name I had forgotten who writes he was one of my guests. Please excuse this this wandering epistle but I thought perhaps you would not mind my troubling you with the account of a peculiar incident long since past as I shall soon be now 82! Thanking you for you kind words in my sore distress. Born at Halstead Hall, Kent, Feb 8th 1837. Educated at the Royal Naval School, went to India in the employ of Messrs Grindlay & Co Bankers. The sailing ship, in which he was, lost 14 men over- board in a gale in the bay, E.G.M. & other passengers had to work the ship to Colombo, Madras & Calcutta. They went round the Cape. He left Grindlays & went into the Uncovenanted Service a served as Deputy Magistrate, during the Mutiny he served as Intelligence Officer with the 3rd Sikh Cavalry. He was small & light & rode in the Calcutta Derby in 1858 (7st. & 13lbs). He came home on leave and read for the Bar, was called, returned to India and got a years leave, went to Rangoon where he practised as a Barrister and was very successful; left the Uncovenanted Service. Before leaving he was in the Indigo riots in Bengal & received the thanks of Government; he was sent down in the Sonthal rebellion to help pacify the disturbed district of Bakour, where he shot tigers; he was invalided home & then passed for the bar. He practised in Burma. 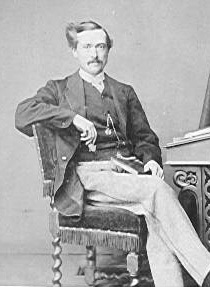 He returned to England in 1878 after being Government advocate in Burma. He took a keen interest in politics & Church Defence & did a good deal of lecturing. He practised at the English Bar for ten years as he had made a small fortune in Burma and wanted to become an M.P. But he lost all his money in the Jabez Balfour frauds & returned to Burma for 6 years, made money & retired to England, Walton-on-Thames & then to Sandgate, Kent, became Master of the Butchers Company was appointed a lay reader by the Archbishop of Canterbury, became a J.P. and chairman of the local bench, Elham Valley. He was mentally and physically very active, a good boxer, horseman and whip, he rode some 300 races in different parts of India & Burma, was the author of one or two books, Sonthalia & the Sonthals, Papal Aims & Papal Claims etc. The following story gives some idea of his enterprise & agility. An Italian warship lay in the Rangoon River; she gave a large luncheon party. Someone bet EGM that he would not climb up the main mast & touch the truck. He took the bet; removed his coat & in his best clothes & boots accomplished the feat, the last 40 feet or so up a bare pole with only a small rope hanging beside it rove through a block in the truck; & this after a heavy lunch & under the tropical sun. I know the story is true as my mother his wife watched him do it E.G.M. was a first class raconteur & after dinner speaker. He was very popular because he genuinely loved his fellow men & was always doing someone a good turn. He married Catherine Jane youngest daughter of James H. Matthews senior partner of Messrs Grindlay & Co, Agents & Bankers. She was probably one of the most lovable & saintly women that ever lived. I think that she was nearly as perfect as a woman could be. As a girl she was very nice looking with dark hair & blue eyes. Her rule of Life was self-discipline, she always sat in an upright chair; she never lounged. When elderly she had a fall from a carriage and hurt her hip and became lame with a good deal of pain, but she was always cheerful & never complained. She was entirely selfless & placid; faith & maternal love radiated from her, her very presence was a benediction. I once asked her why she was so certain that Christianity was true. She replied, ‘I just know that it is true. If proof were needed the daily and immediate answers to one’s prayers would provide it’. St. Martin’s Plains, Shornecliffe, Kent. We have had very changeable weather lately, but I am glad to say that the huts are very much more comfortable than tents. I went down to Halstead yesterday afternoon, and met Elaine, who is staying there now. I think that she has changed very much, but is not so tall as I expected. Aunt Dorothy says that Stella is taller than Elaine now. Grandpapa invents the most extraordinary names for her, such as “Old Swipey – Matilda Jane”, in fact he says the first one that comes into his head. Last night at dinner he announced “My inside is all out of order, I swallowed two corkscrews, and they are both stuck in my navel”. “Oh Edward Edward, do be quiet”. (from Granny) – “Well what’s the matter now Mother. I’ve got a navel haven’t I?” “Edward, we’ve heard enough”. Also “I’ve got an unkind wife who doesn’t care what happens to me. I can feel those corkscrews all the time” etc. 1867. Sonthalia and the Sonthals. Published in Calcutta by G. Wyman & Co. (195 pages) (Republished in 1989 in Delhi by Mittal Publications). 1885. Mention of the EGM AND Kate in the August 1 Croydon Guardian. 1912. Lecture on immortality’ pamphlet can be read here.